Admit it. For months (years!) 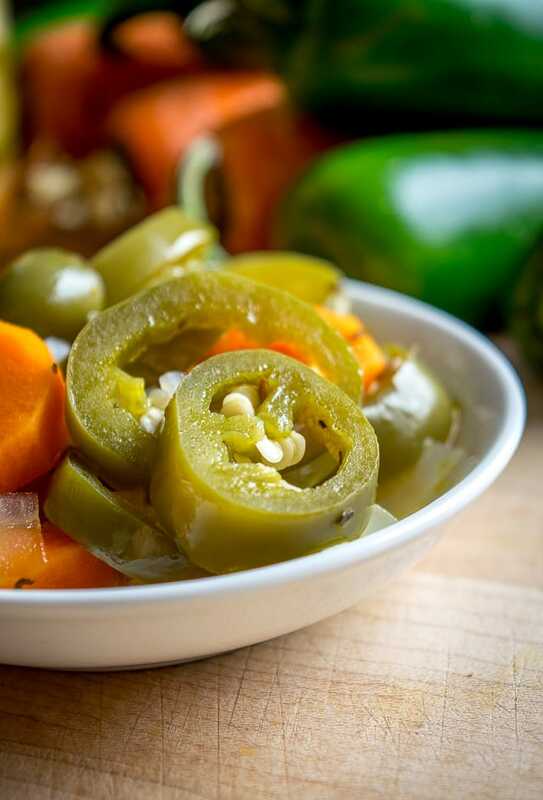 you were guilty of bypassing the bowl of mundane looking pickled jalapenos and carrots served up at your local taqueria. What could those possibly do for me? Next. And then you tried one. Now when you’re scoping out a new taco joint you give a terminator-like scan for your beloved pickled goodies. Luckily it’s easy to whip up a batch of these at home, ensuring that your perfectly balanced taco bite is always within arm’s reach. Print out this pantry list and you’ve got instant access to 27 authentic Mexican recipes. Please consider the following ingredient pic a reference point only. 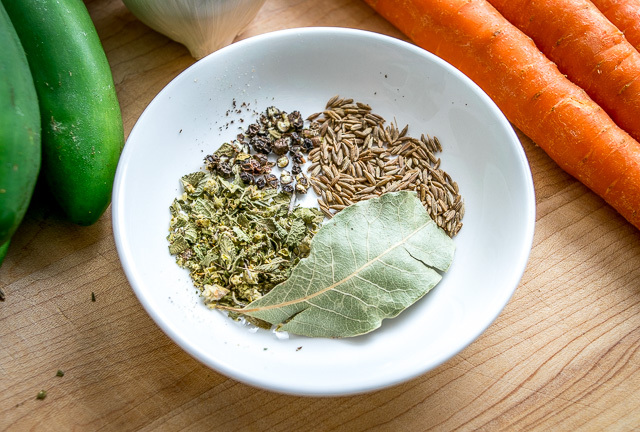 The veggies and vinegar are doing most of the heavy lifting, so if you don’t have all the spices on hand go ahead and make them anyway; most likely you’ll be happy with the results. 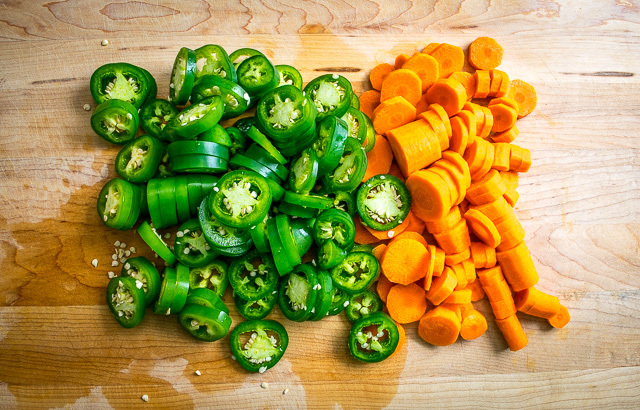 Give the jalapenos a good rinse and peel the carrots, cutting both into 1/4 inch sized coins. 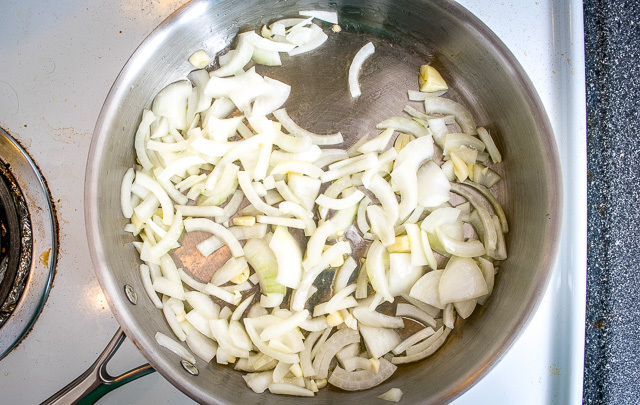 Saute a sliced onion and 4-6 roughly chopped garlic cloves in a big dollop of oil. As this sautes for a couple minutes, gather the dry ingredients. That’s 8-10 cracked black peppercorns, 1/2 teaspoon cumin seeds, 1 bay leaf, and 1/2 teaspoon Mexican oregano (regular oregano is fine too). Add the jalpenos and carrots to the saucepan. Saute briefly and then add 1.5 cups of white vinegar, 1 cup water, and 1 Tablespoon of salt. Note that Kosher or pure sea salt are most commonly used for pickling. The additives in iodized salt will sometimes affect the brine so it isn’t recommended. 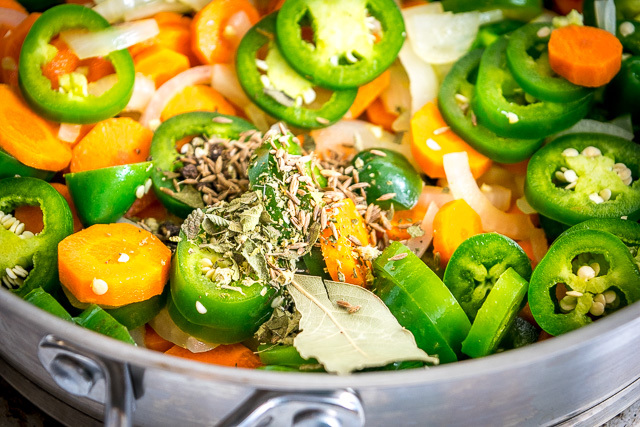 Let simmer for 10-15 minutes or until the jalapenos turn army green. 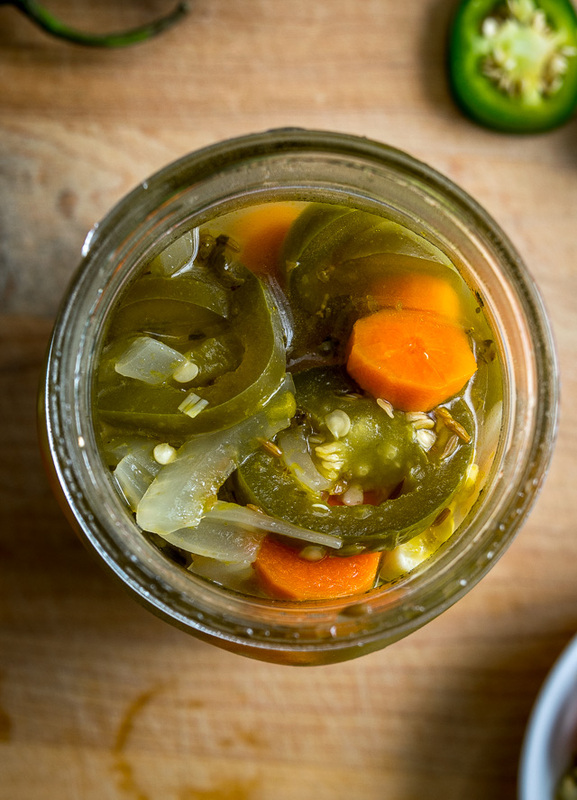 Each pint-sized jar gets loaded with jalapenos, carrots and topped with the brine. I let them cool on the counter a bit before putting them in the fridge. After a few hours of resting in the brine they’ll be ready for some taste testing. 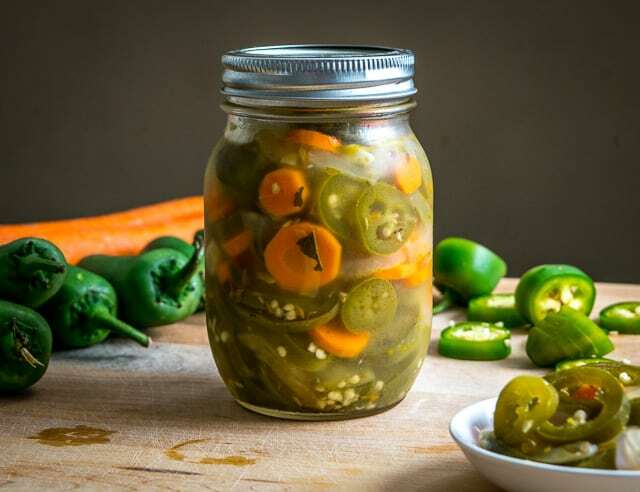 These pickled jalapenos will keep in the fridge for a month or so, after which you can take the afternoon off of work to make a new batch. Priorities right? P.S. Now that you’ve got them in hand you can make our Spicy Chicken and Pickled Jalapeno Pizza. 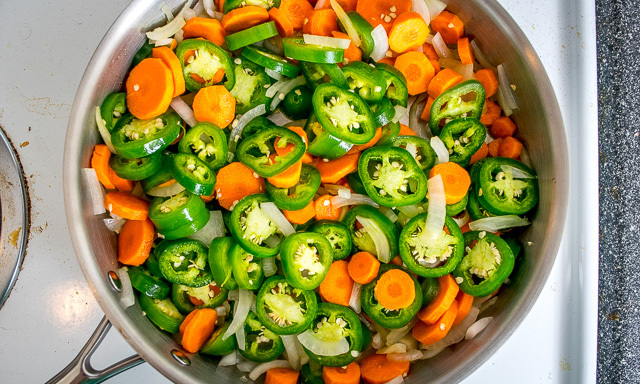 Give the jalapenos a rinse and then cut into 1/4 inch slices. 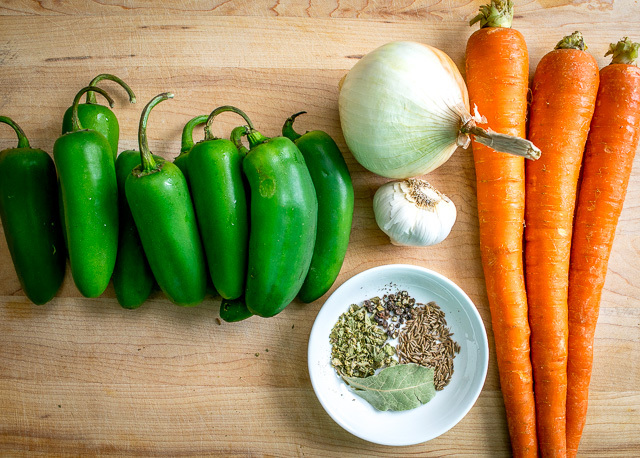 Add the jalapenos, carrots and the spices: ½ teaspoon oregano, ½ teaspoon cumin seeds, 8-10 black peppercorns, 1 bay leaf. Kosher, sea or pickling salts are the most common salts used for pickling vegetables. Iodized salt isn't recommended as sometimes additives will affect the brine. Glass containers seem to be the best choice for storage of this vinegar based brine. Metallic containers not recommended. It's also best practice to use a non-reactive pan when heating up the vinegar. You can easily modify the above recipe to create some Mexican Pickled Carrot Sticks. 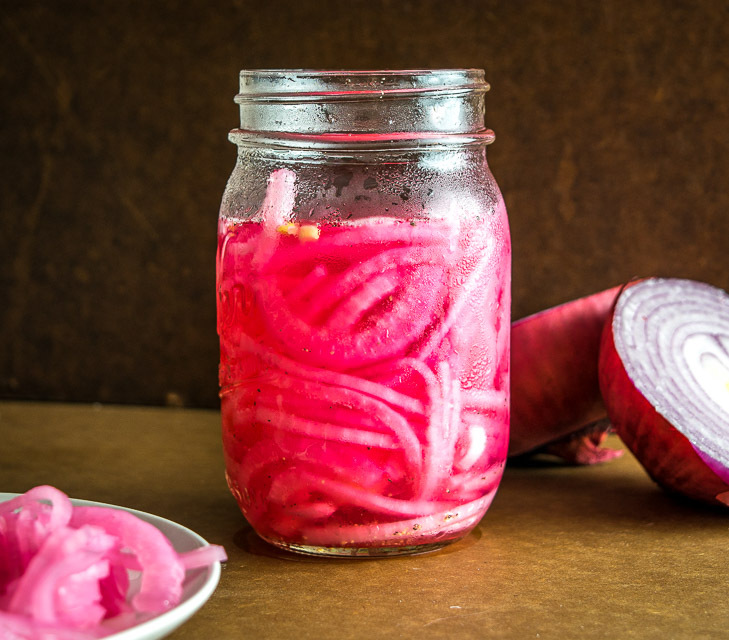 And here’s an easy way to make some Pickled Onions. 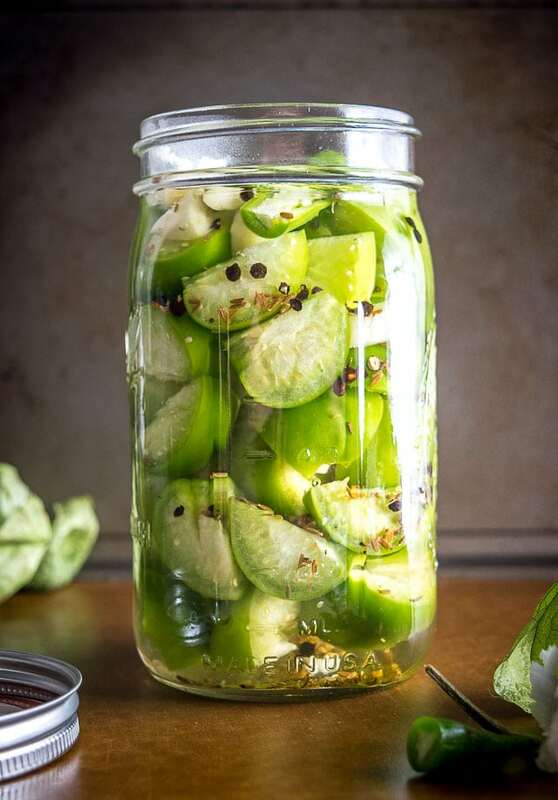 Or you can use a similar technique to make some Pickled Tomatillos. Check hot water bath canning for long term canning storage. This recipe says specifically NOT FOR CANNING. However, I made some modifications & canned them using a boiling water bath. 1. Cut all your veggies, as described. I actually added a few random sweet peppers from our garden, too. You can toss them altogether in a big bowl, once prepared. DO NOT COOK ANY OF YOUR VEGGIES! 2. Fill your canning pot with water, bring to a boil, & drop your canning jars, lids, & rings into the water to sterilize. Use jar tongs to immerse & remove the jars. You can drop the lids & rings in & remove them with regular tongs. Set them aside in a clean, dry area to keep them from getting contaminated. 3. You’ll use this same canning pot to actually can your Jalapenos & other veggies, so be sure your canning bath has enough water in it still to cover your jars. If not, add more water & bring to a low boil. 4. Prepare a vinegar brine using the same proportion of vinegar to water & add your spices. Bring these to a boil, & then turn the heat down to a simmer. 5. 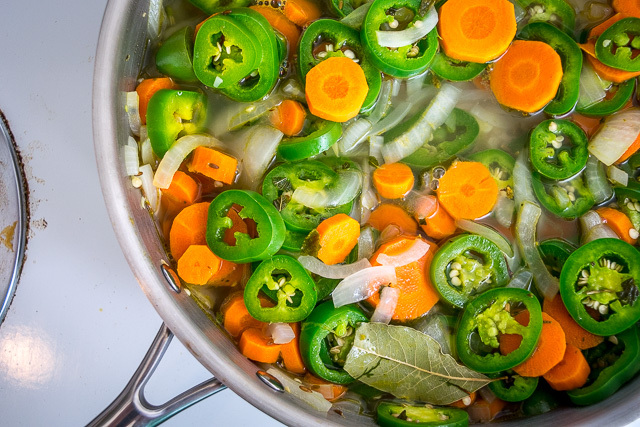 Using a canning funnel, spoon the mixed veggies into your jars, leaving at least a 1/2″ headspace at the top. You can tamp down the veggies into each jar. 6. Using a ladle & the same canning funnel, pour the vinegar brine into each jar until your jars are full to 1/2″ at the top. Be sure to ladle down to the bottom to pick up some of the spices–otherwise they will have sunk to the bottom of your brine solution & will be left for the last jar! 7. Carefully, using gloves, place a lid onto the jar & tighten a locking ring over it. You don’t have to tighten it so much you can’t open it again. Just enough so that it’s a tight seal. 8. Using canning tongs, place your filled jars into the boiling water bath & boil for 15 minutes. 9. Remove your jars with canning tongs & set them somewhere to cool. 10. Listen for the lids to “pop.” That means that the seal is good. This could take from minutes to several hours. But once your jars are cooled completely, you can check the lids. They should be completely flat. If you see a tiny bulge in the center once the jars are cooled, then that jar didn’t seal correctly, & you should discard it–or just eat it immediately! 11. The recipe, as stated, is perfect for 2 pints. I made 6 pints, so I tripled the amount of everything, & I had nothing left over. Just finished making 1/2 recipe and there was not enough brine to cover. Other than that they are delicious! Hi Bernetta, I think it’s okay to top off the pint jars with a bit of water if some of the brine has burned off during the saute. That’s assuming you are eating them over the next few weeks and not doing long term canning. You should be able to figure out if you need to add brine while it is on the stove. If it is not covering the veggies in the pot it will not cover them in the jars. 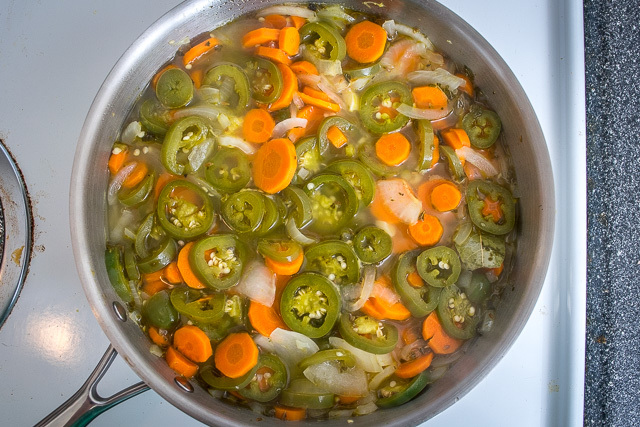 I had to double the brine mix, but I used very large carrots and jalapenos. Probably another note worth adding is that if you’re one of those people who likes a little zip and not a lot of zip, removing some or all of the seeds from the jalapeños will help a lot. We only like the carrots in my household–although my husband will eventually eat the rest–so I’ve been looking for a recipe that minimizes “the other stuff.” Will definitely be trying your recipe tomorrow after I get back from the market with an onion. Yup good point Annalisa, thanks much for mentioning this! I see you you mentioned on pizza, which I was going to suggest. The jalapenos taste incrediable drained of brine and stored in olive oil. Pizza without them will not be the same. Also the oil can be used in cooking. It may be too hot for some. Hola Deborah! Wow that’s a great idea, I rarely use flavored oils but might try it with these pickled jalapenos. Could also use the oil in this pizza as we are already adding a thin layer of garlic oil to prevent dryness. Thanks much for the inspiration!! Made this exactly as you have said and it was great. I am looking to ramp up the heat a bit though. Do you think adding some Serranos and habaneros alog with the jalepenos would work the same with this recipe. Probably take out 3-4 jalepenos and add 3-4 each of habaneros and serranos and keep the liquid ratios the same? Have you done anything like this before? Hey Nathan, sorry for the delay in getting back to you! as it ‘marinates’ overnight the heat from the habanero should add additional zing to the jalapenos and carrots. Regarding the serranos, yes they are slightly hotter than the jalapenos but I don’t think it would be enough of an increase in heat for you, so I would first try it with the Habaneros. I hope this helps a bit. If you give it a try let me know how it goes as I’m kind curious about it now. Cheers. Thanks for the reply. I have actually made 3 batches now. I think I got it perfect for my taste. I do everything exactly the same as you have your recipe except for a minor change up in the chiles. The ratio that I like best is 10 Jalepenos and 8 habaneros. I cut the habaneros much thinner. for me the Jalepenos are a great flavor and the habaneros just add a little extra punch. I’d reccomend trying it. It isn’t as spicy as it sounds. Also makes for an incredible “Juice” that my wife and I will put on top of just about anything even if we don’t want to eat the peppers. I’ve had coworkers try this recipe and love it. Yes, it is spicy, but not near as much as you would think. They flavor is great as well. Thanks again for the recipe. Awesome jalapeno trip report Nathan! Thanks much for your note it’s super helpful for other peeps out there seeking a little more spice!! 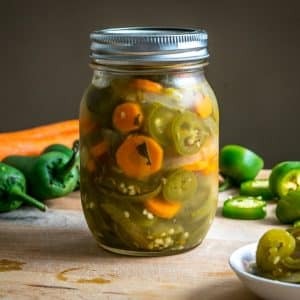 Is it ok to pickle jalapenos in just vinegar & oil, maybe water? Hi Mary, I’ve tried something similar to this before. Instead of cooking them off with onion/garlic and adding spices, I simply chopped up some jalapenos and let them rest in a vinegar/water mixture. And while they did have a pickled flavor, I have to admit that I was a bit disappointed in them. They seemed to lack the punch of the original recipe. So yes, you can give them a quick pickle in some vinegar and water, but I think a ‘flavored’ batch is far superior. Hope that helps a bit! Thanks so much for this recipe – it is exactly what I have been looking for! I like my carrots A little al dente, so I added them a little later so that they didn’t cook quite so long. I added some of the cooked jalapeños and some fresh radish slices to a separate jar and topped it off with my left over brine (I doubled the brine) and they are delicious as well! Thanks much for your feedback and notes CdP — makes me want to try adding in some radishes to my next batch! Cheers. Making this for my hubby now. Can’t wait to see how he likes it! Hi Brenda, I’m a huge fan of these pickled jalapenos — I hope they turned out well for you! Hope you get this soon. First let me say I haven’t made them yet my question to you is this. Me and daughter love pickled jalapeños so I would make a gallon or two they will be eaten before a month is up. I would like to make them whole and crunchy with all the flavor would I have to do it defrent? Hi William! If you want to make them whole and crunchy I would probably just add the whole jalapenos in at the end of the simmer but do everything else the same. Cooking the jalapenos will soften them up a little bit so if you limit the amount of time they’re in the pan you should get plenty of crunch. I’ve never made them like that and they might not take on as much flavor compared to chopping them up and letting them simmer, but I think you’ll still be happy with the result. We have made 2 batches of this. One with some seeds left in and hubs said it was HOT but he loved it! Second batch we made sure we got all the seeds and ribs and it made a much milder catch. He seriously cannot stop eating them. This is a great recipe! Next batch we will leave out the carrots, he says they just take up space, haha. Ha awesome, if it seems like the carrots are hogging space from the jalapenos that’s a good sign! 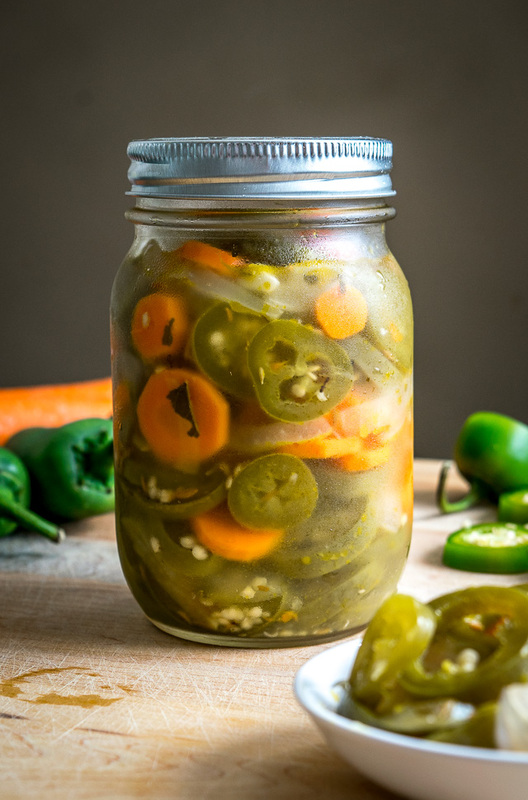 I have made lots of Pickled Jalapenos in my life but this recipe is the best.I can throw all my others away ,this will be the only one I will be making from now on. Cheers Feriba! I make this recipe all the time and it never gets old. This recipe is very, very good! I made one batch yesterday night and this will stay on my rotation! Thanks Martin, I’m a huge fan of these pickled jalapenos! Patrick, this is an excellent recipe. I took a quart jar to work and everyone RAVED about these pickled jalas, etc. Kudos to you! This will be my standard recipe when it comes to harvesting my jalapeno plants next summer. Thanks for the feedback Skyye! That is definitely one way to spice up the workplace. Yum! I could eat that everyday all day. What acidity degree is it typically on the white vinegar you use? I’m trying to recreate this in Europe so just want to make sure I get the right acidity. Hi Gustaf I’m pretty sure that it’s 5 percent acidity. 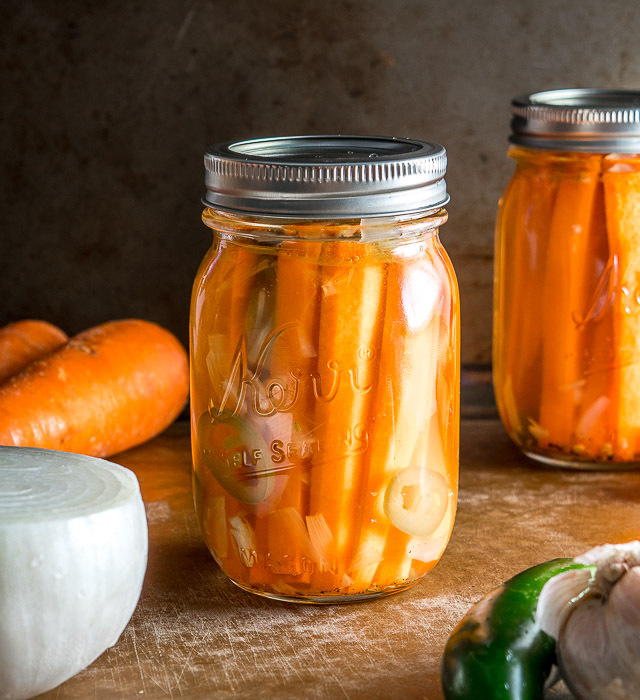 I typically use a plain old white vinegar when pickling and it seems like most of those max out around 5 percent in the States. Hope that helps a bit. Cheers. I added a tablespoon of sugar to calm it down abit. Definitely a keeper. Great recipe, thanx. 2nd time i made it, i let it cool and poured over sliced cucumbers in a plastic container and set in fridge a couple days. It works for me. Hi Patrick- I want to add Cauliflower to this recipe. How much would you suggest and when should I add them? I am also definitely taking Nathan’s suggestion of 10 jalepeños and 8 habaneros to ramp up the heat! Hi VF, although I’ve never tried it with cauliflower I think I would just add it at the same time as the jalapenos and carrots and go from there, using an amount similar to the carrots. And 8 habaneros should definitely raise the heat level! I was wondering if I can do this with garlic cloves? Hey Joe, I haven’t tried pickling garlic cloves yet so I can’t say for sure, but it’s worth a go if you are craving them. I would prob just bring the seasoned vinegar mixture to a boil and pour it over the raw garlic cloves in the jar. Our Pickled Onions has measurements for a pint-sized Mason so that could be a good reference. And I’m now getting curious about this so thanks for the inspiration! Thanks for sharing this. I can’t wait to try them. I’ve wanted a quick and easy way to get pickled jalapeños for a long time. You’re the best! Cheers Bill I hope they treat you well — definitely one of my favorite recipes on the site!! I’ve done this recipe probably 20 times! For a tasty Cilantro Chimichurri combine this in a blender along with chopped cilantro and lemon juice. Great with Carne Asada or eggs…. Hey thanks for that tip Zonk, will try that soon!